Other Toys Racks on boat allow for combination of any 6 water toys, please discuss prior to charter if all 6 SUP's preferred or 4 SUP's and 2 kayaks etc. MASTER CABIN: Large master suite aft with king walk around berth, plus his and her’s separate baths, each with an electric toilet, vanity and sink, and one shared shower. Crew allows flexible arrangements, depending on families and number of guests. 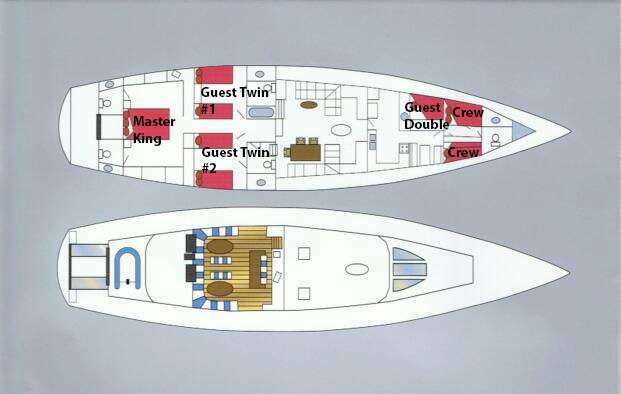 MID-SHIP TWIN CABINS (2): Each of the two cabins has 2 built in twin beds and one pullman berth (slightly smaller than twin size), plus each has a private en-suite head with electric toilet, vanity/sink. One head has a tub and the other has a standing shower. MAIN SALOON: Saloon has two built in sofas that can sleep one each. Must share a guest head. The Salon is spacious, fully air-conditioned and well appointed with dining on the starboard side and lounge area on the port side. There is a lovely bar in the salon as well. PILOT HOUSE: Up the companionway there is a large air-conditioned pilot house with seating and a bar all offering a 360 degree view. The pilot house has opening windows and aft wall removes if clients prefer open air. The aft deck offers table and chairs under the large sun awning and obviously guests can sunbath on the huge decks. Shawn holds a Bachelor’s Degree in Naval Architecture & Marine Engineering from the U.S. Coast Guard Academy, & a Master’s Degree in Social Organizational Psychology from Columbia University. He served nine years at sea in the U.S. Coast Guard aboard cutters ALEX HALEY (Kodiak, AK), KUKUI (Honolulu, HI), & CAMPBELL (Kittery, ME). He also commanded Cutters ADAK (Manama, Bahrain) & KISKA (Hilo, HI). He is a licensed Merchant Mariner with a 1600-ton Oceans Master License. Now that we’ve gotten all of the really serious things out of the way, we figured you’d like to know a little more about this one. He’s pretty cool. Shawn is a talented craftsman. He makes cutting boards, paddles, picture frames, & much more, all from really beautiful wood. He’s a die hard fan of pretzels. Any kind of pretzels. Most of us consider Shawn to be amphibious. He spends much of his time underwater, sometimes to the concern of others. Jackie has an extensive background in Sales, Marketing & Customer Service. Having worked over 15 years in retail, she honed her skills in team trainings, customer education, customer service roles, and most recently in taking a small business from conception through branding, product development and finally to market in nationwide retail outlets. Jackie currently handles website development, marketing, branding, social media & reservations for Becket Benders. She LOVES cooking and testing new recipes (which is really code for eating new recipes). While she thrives in good weather, she loves a good, dreary rainy day – that’s the Seattle girl in her (she was born there!) She’s a family girl through and through. Chris holds a Bachelor’s Degree in Marine & Environmental Science from the U.S. Coast Guard Academy, & Master’s Degree in Fisheries & Wildlife Administration from Oregon State University. He served eight years at sea in the U.S. Coast Guard aboard the cutters ALEX HALEY (Kodiak, AK) & EAGLE (New London, CT). He commanded the cutters DORADO (Crescent City, CA) & JEFFERSON ISLAND (Portland, ME). He has also commanded sailing school tall ships ROBERT C. SEAMANS & CORWITH CRAMER as an assistant professor of nautical science at Sea Education Association (Woods Hole, MA). He is a licensed Merchant Mariner with a 1600-ton Oceans Master License.